Going to the beach at Jean Klock Park and submerging yourself in warm sand, while letting the fresh water mist hit your face is one of the best experiences in the world. Whenever I embark on a full day at the beach, I am always sure to bring along my Yeti Roadie 20 cooler along to pack my essential refreshments. The Yeti Roadie 20 has all of the characteristics to be the optimal beach cooler, far exceeding my expectations that I had for a cooler of this size. Living along Lake Michigan, myself and my wife are able to go by the water front all year long, so it was important to us that we purchased a cooler that not only had a good enough capacity to carry a perfect amount of refreshments for two people, but also was durable enough to withstand constant usage and transport. My buddy Dennis over at FishingWithDennis.com first recommended the Yeti brand to me. To put it bluntly, other personal coolers just do not stack up to the all-around performance of the Yeti Roadie 20 cooler. The Michigan sun can be pretty unforgiving with it not sparing the wrath of its UV rays to anyone. We enjoy dairy products and we will often bring some for our beach picnics, which run the risk of spoiling and making us sick if they are not properly refrigerated. We don’t have to worry about our food perishing with our Yeti Roadie 20. As a leading runner in ice retention within the market of ice chests, Yeti has perfected a tested and confirmed formula for their insulation to hold ice longer than most coolers in retail. Even in piping hot 90 degree weather, we would pop open our Yeti Roadie 20 and be shocked to find that nearly all of the ice was still completely frozen—even after an entire day! Yeti’s unbelievable ice retention is due to the very thick Permafrost insulated interior. 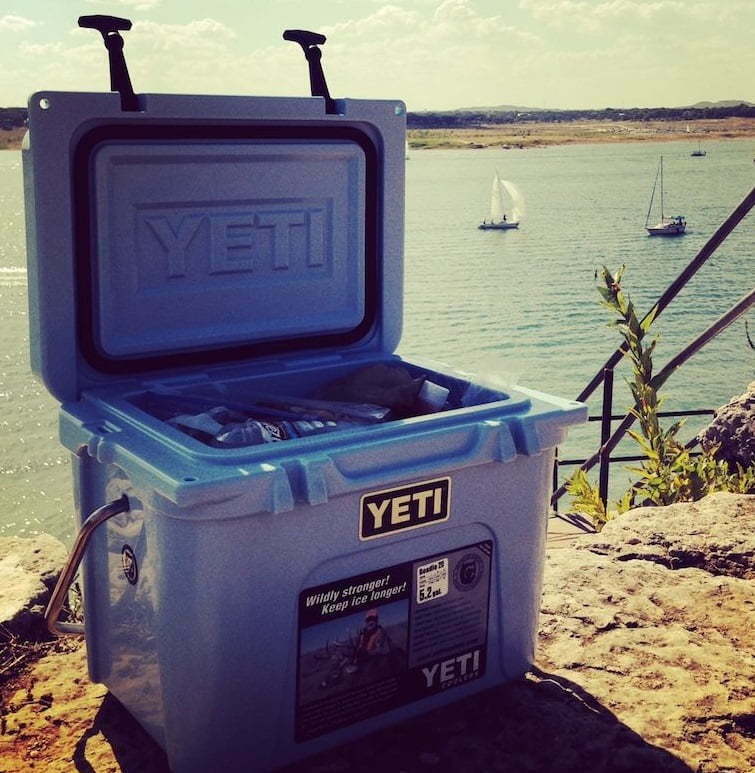 Yeti Coolers even has all of their coolers injected with pressure to reject outside temperatures and keep everything inside at the lowest temperatures possible. Our Yeti Roadie 20 is so powerful that it can even hold the extremely low temperatures of dry ice, for items we really need to keep frozen. While some occasions call for a large cooler that may be a little hard to carry around, a day at the beach is not one of them. Finding a cooler that is easily transported from place to place without any strain is key when choosing a premium beach cooler. The Yeti Roadie 20 only weighs a mere 16 pounds, so even when it is filled with refreshments, it is still very easy to carry. For its small stature, it is really surprising how much content the Yeti Roadie 20 can hold. At a 23 QT capacity, the Yeti Roadie 20 can hold around 14 cans and a large amount of ice comfortably. The Yeti Roadie 20 can fit perfectly in the backseat of a sedan or in an average-sized trunk, which means it won’t take up much room in your vehicle. There are plenty of accessories to add on to your Yeti to increase its already top portability. Next to our beach towels and swim suits, our Yeti Roadie 20 has become our must have accessory on our frequent beach days. If you are looking for a beach cooler that won’t let you down, then the Yeti Roadie 20 is the only choice for you. Disclaimer: ProtectJKP.com provides lists of the best fishing & outdoor products and gear for people who quickly want to know what to get. When readers choose to buy our independently chosen editorial picks, we earn affiliate commissions that support our work.